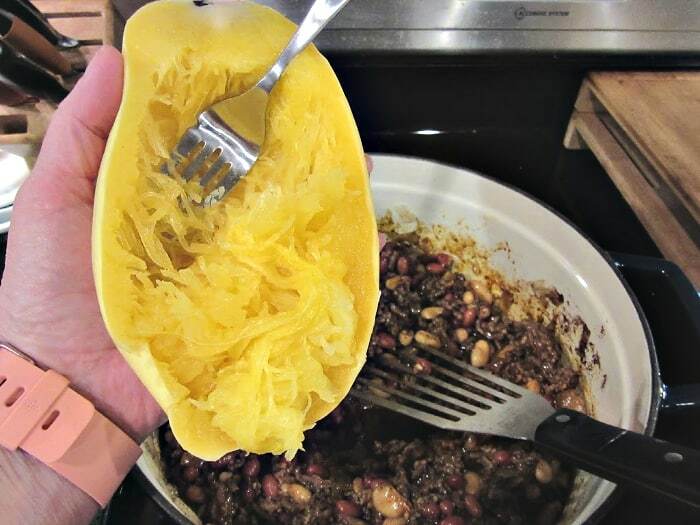 Spaghetti Squash Chili is one of the easiest spaghetti squash recipes for the microwave you’ll find. It’s roughly 30 minutes from start to dinner. It’s hot, hearty, healthy, and completely delicious! 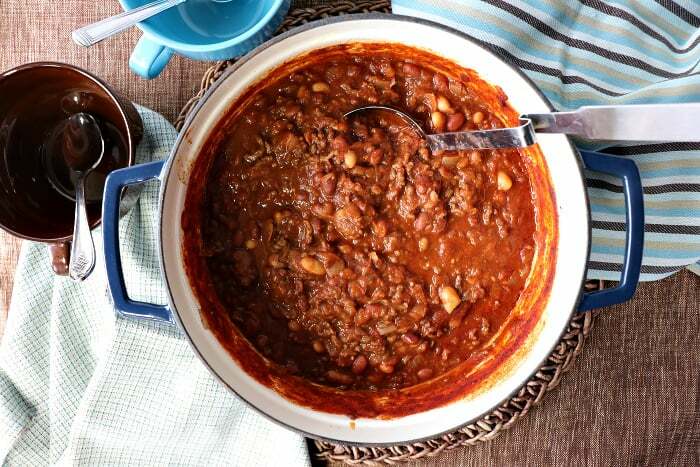 Dig into this Healthy Microwave Spaghetti Squash Chili! Your body and your taste buds will thank you! 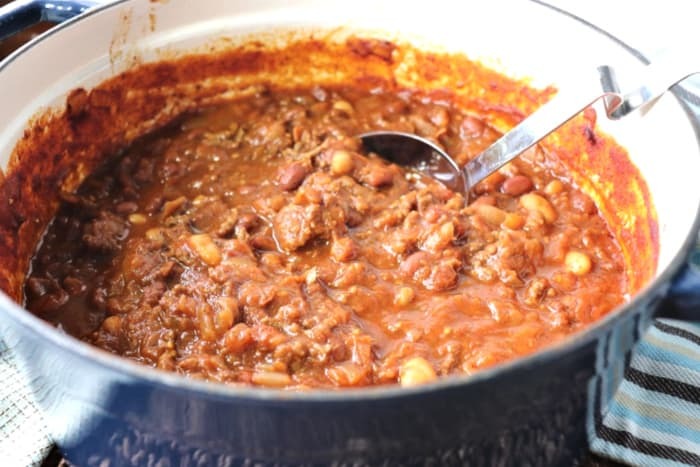 **Please Note – The printable recipe card with detailed instructions, complete ingredient measurements, and nutritional information for making Healthy Microwave Spaghetti Squash Chili is available near the end of this post. Grab the knife handle and as you would use a hammer hit the spaghetti squash firmly on the counter. 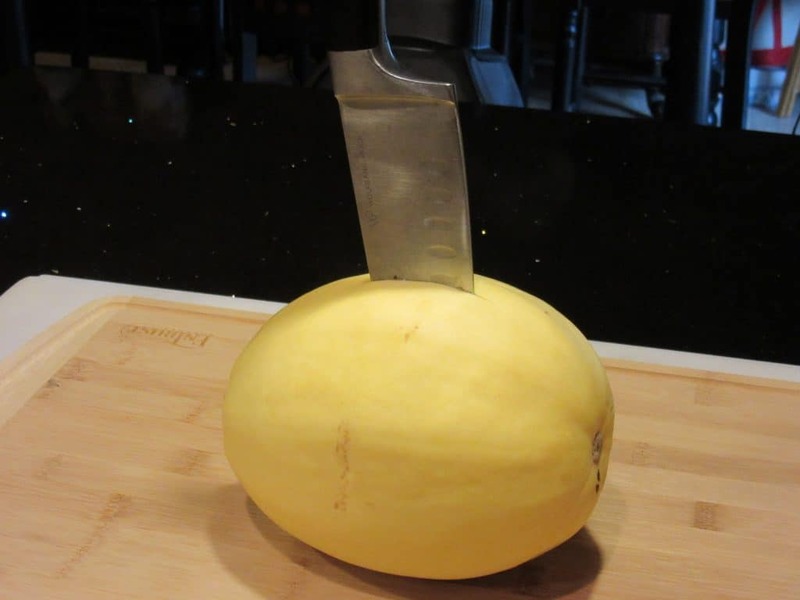 The force of the squash hitting the counter with the knife inserted should be enough to split the spaghetti squash pretty evenly in half without too much extra knife work. Carefully insert a chef’s knife, lengthwise, into the center of the spaghetti squash. An ice cream scoop works well for removing the seeds from the spaghetti squash. Place a split and seeded spaghetti squash into a microwave safe dish, cut side down. Add approximately ¼ cup of water to the dish and cover with cling wrap. Poke a hole in the cling wrap to let the steam escape. Microwave on full power until the spaghetti squash is soft. Carefully uncover the squash and allow to cool until it’s cool enough to handle. Scrape the interior of the cooked spaghetti squash with a fork to remove the strands, and discard the shell. Spaghetti squash is very low in calories and is a great source of dietary fiber. It’s naturally gluten-free and can be used as a substitute for pasta. Spaghetti squash is loaded with vitamins A and C. They also contain a higher source of B complex vitamins (folate, niacin, and B6) than their counterpart, a pumpkin. How long does spaghetti squash keep? 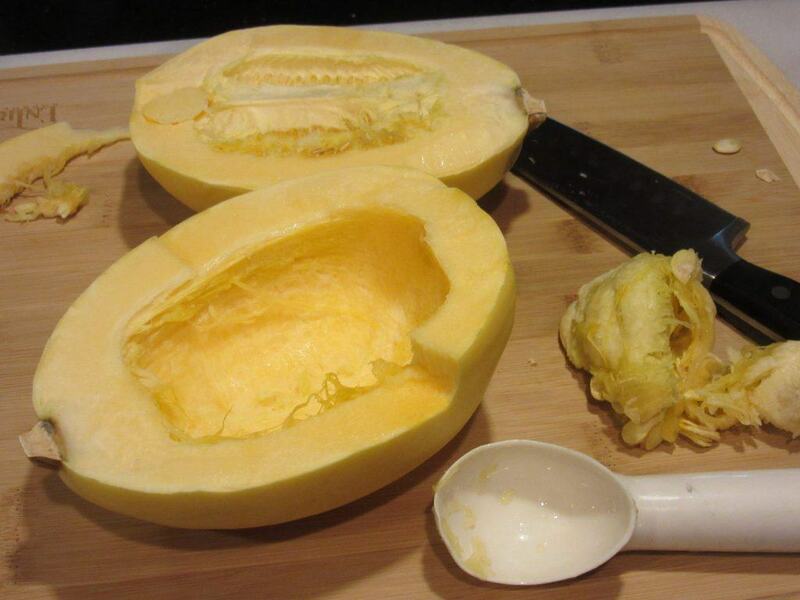 If kept in a cool dry area spaghetti squash can keep for up to 3 months. Purchase firm, non-blemished spaghetti squash, and one with a brownish stem, not green. 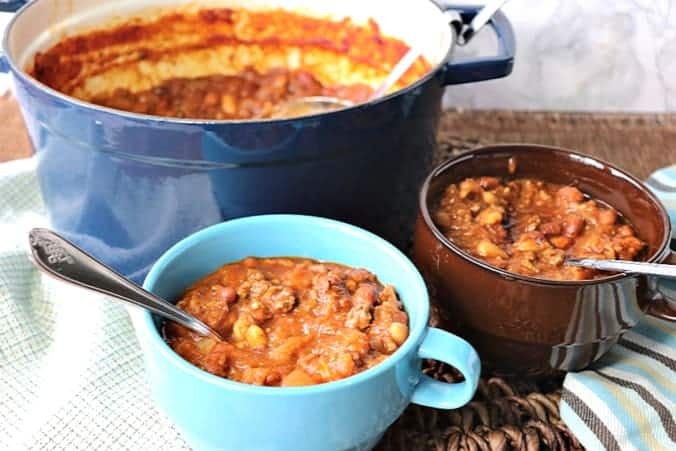 **The following affiliate links are some suggested products I’ve chosen that will aid you in the making and serving of this recipe for Microwave Spaghetti Squash Chili if desired. Below is the printable recipe card for today’s Healthy Microwave Spaghetti Squash Chili. 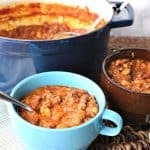 Spaghetti Squash Chili is one of the easiest spaghetti squash recipes for the microwave you'll find. It's roughly 30 minutes from start to dinner, and it's hot, hearty, healthy, and completely delicious! Carefully split the spaghetti squash in half, lengthwise. Remove the seeds. Place the spaghetti squash, cut side down in a microwave-safe container. Add approximately ¼ cup of water to the dish and cover with cling wrap. Microwave on full power until the spaghetti squash is soft. Carefully uncover and set aside until cool enough to handle. Add the oil to a large, heavy bottom, stock pot and saute the onion for approximately 3-4 minutes. Add the ground beef to the pot and brown, stirring occasionally. Add the salt, pepper, drained beans, chili powder, cumin, garlic to the pot and stir well. Scrape the strands from the cooked spaghetti squash and add them to the pot. Add the tomato sauce to the pot along with the hot sauce. Stir well and simmer on low for 15 minutes. 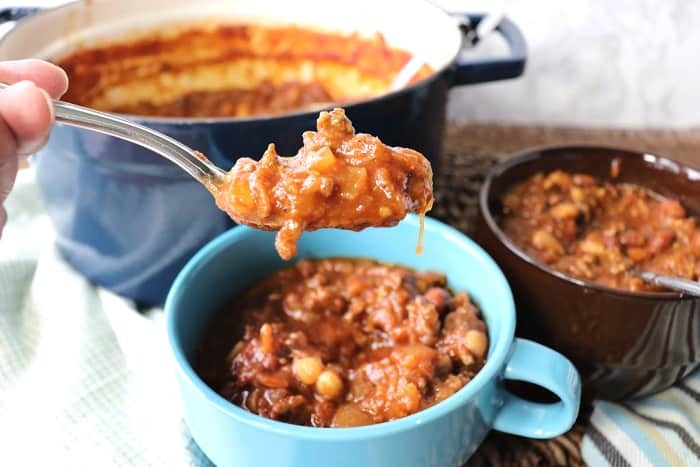 I sincerely hope you’ve enjoyed today’s recipe for healthy microwave spaghetti squash chili as much as I’ve enjoyed bringing it to you! Love this! 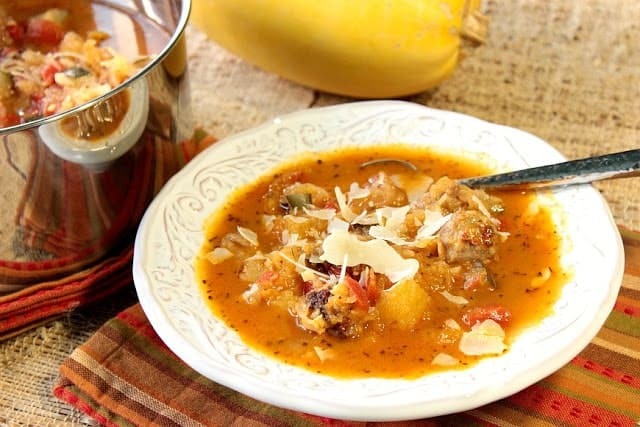 It never occurred to me to put spaghetti squash in my chili, but it’s such a good idea! Glad you like it, April. Thank you! Thank you for this recipe! I am on a low carb diet and constantly looking for new comforting recipes! I really love this idea! Such a perfectly satisfying meal!